It's time to let Hannah go. 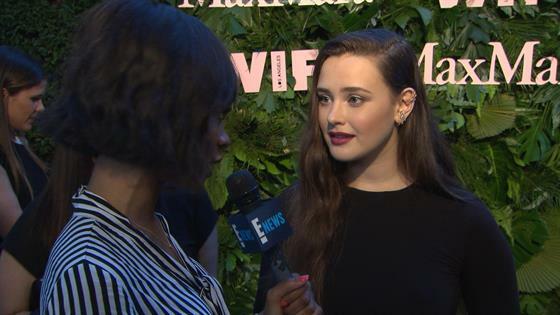 13 Reasons Why is saying goodbye to Hannah Baker, with Katherine Langford exiting the hit Netflix drama ahead of its recently announced third season. Langford broke the news to the show's loyal fanbase herself on Instagram, posting a heartfelt message to her fans and to her beloved character, who appeared via flashbacks in other character's stories and as a ghost-like presence with Clay (Dylan Minnette) in season two. "Even though Hannah won't be in season three or probably any other seasons—if there are any, don't want to start rumors!—but I just want them to know Hannah's story is always something I'm going to carry with me," the star told E! News' Zuri Hall at Vanity Fair and Max Mara's Women in Film event on Tuesday night. "And if people need to reach out, I'm always going to be there in a sense, even if it's small like on social media." 13 Reasons Why was "the first job" Langford ever had, and the way Hannah's journey resonated with viewers meant a lot to the 22-year-old, which is why she felt compelled the write the note to fans announcing her departure, writing ""Hannah...I love you...and I let you go.'" "I've really realized the significance of that role and the story we were able to tell and how it resonated, not just on an entertainment level, but also how it resonated really intimately with people and deeply people, and so I think it was nice for me to be able to share the finality of Hannah's journey and more so my journey in the series." To hear what Katherine said about her friendship with Selena Gomez, an executive producer on the show, and any advice she may have shared, press play on the video above. In a recent interview with EW, Langford assured that Hannah's impact would be felt in the series' future, even if she wasn't appearing on-screen anymore. "Even though she may not be part of another season, I think that her presence and the importance of her and her story will always matter and will always be there, "she said. "To be specific in this season, the big thing to take away is in regards to the trial where her image is distorted and defiled," she said. "At the end of the day one of the really important things to take from this season in regards to Hannah is that it doesn't matter who she was or what she did, she didn't deserve any of what happened to her." 13 Reasons Why is currently available to stream on Netflix, with season three set to premiere sometime in 2019.